Place lima beans, vegetable broth and Bragg Liquid Aminos or salt in a medium size saucepan. Heat to boiling, cover with a lid, reduce heat to simmer for 10 minutes or until limas are tender. Using a slotted spoon, remove lima beans to a bowl and reserve. Add corn, additional water and the Earth Balance or butter to the vegetable broth in the saucepan. Heat corn to boiling, cover with lid, reduce to a simmer for 3 minutes. 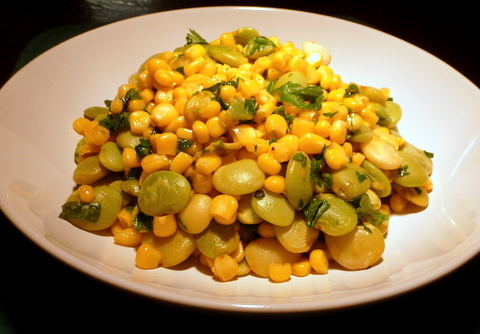 To finish this dish, add chopped parsley, freshly ground pepper and cooked lima beans. Gently stir to mix, and serve.